Have you ever wondered exactly what your prospects think when they see your website? Ever wanted to know why people keep choosing to buy from that "other guy" who will clearly not give them the quality service that you will? Let SEP bring our years of experience to conduct professional and affordable User Testing on your website. 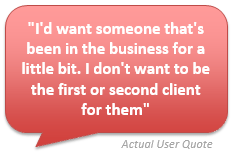 Our clients love our Usability Testing and 100% of our clients so far have felt the information we provided was valuable to their business. Why do visitors bounce off the site? WHY do you lose a customer or prospect to a competitor? What is it your competitor is doing better than you? What can you do to get more visitors to convert on your site? Is your website actually broken and no-one's ever said anything? No-one can figure out what the website sells <- Amazingly, this is our #1 finding!! ...and there is an ad for a competitor on the parked domain, which is where people are ending up! SEP can do usability testing for your website whether large or small. Our User Testing clients range from multinational companies through to small local businesses. We firmly believe that Usability Testing is one of the best steps you can take to increase your sales and revenue, so call today to get yours set up.